"Small amounts of the rich blue cheese goodies add just the right flavor to a very fresh tasting salad. This is my nothing-else-could-possibly-make-me-happy-for-dinner salad. Happy eating!" 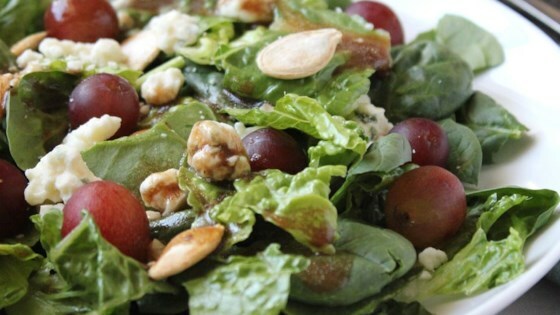 Toss together the spinach leaves, grapes, blue cheese, and pumpkin seeds. Serve with blue cheese salad dressing if desired. Really good! The only change I made was to substitute toasted sunflower seeds for pumpkin. This was quite tasty. The grapes were what made the salad. Will make again. I really liked the grape and cheese together. I did use another dressing, because 1 TB of blue cheese is quite enough for me :=) Thanks for the recipe! If you can find it, try smoked bleu cheese....delish. I wouldn't use bleu cheese dressing as others suggest....a vinaigrette would not interfere with the bleu cheese, or overpower.